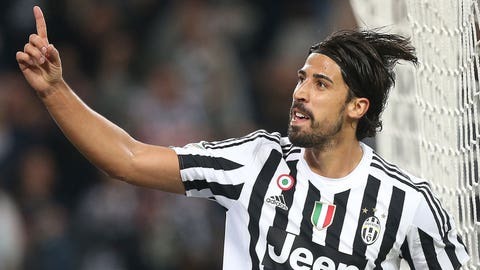 Juventus' midfielder Sami Khedira from Germany celebrates after scoring during the Italian Serie A soccer match between Juventus and Bologna. MILAN – Four-time defending champion Juventus recorded only its second league win of the season as it came from behind to beat bottom side Bologna 3-1. Striker Alvaro Morata inspired Juventus to a come-from-behind 3-1 victory over Bologna on Sunday. The Spain international hit the back of the net for the first time in Serie A this season in the 33rd minute to cancel out Anthony Mounier’s fifth-minute opener. Morata also earned a penalty seven minutes after the restart when he was brought down by Bologna’s Alex Ferrari in the area and Juve team-mate Paulo Dybala converted the spot-kick. Morata then set up fellow former Real Madrid star Sami Khedira, who wrapped the victory in the 63rd minute. The outcome in Turin is only Juve’s second league win this season. Morata, who had scored in Wednesday’s 2-0 triumph over Sevilla in the Champions League, had the first chance of the game in the fourth minute when he struck a diagonal effort which was saved by Bologna goalkeeper Antonio Mirante. The visitors broke the deadlock one minute later. Adam Masina’s cross found Mounier in the box and he struck a left-footed shot past Juve keeper Gianluigi Buffon. Juve pulled level when Khedira’s cross took a deflection off Daniele Gastaldello and found Morata, who headed home from close range past Mirante. Before the interval, Hernanes warmed the hands of Mirante with a stinging drive from 30 yards which the keeper saved. The hosts went ahead when Dybala sent Mirante the other way while driving his spot-kick towards the left-bottom corner of goal. Juve extended their lead after the hour when Khedira headed Morata’s cross past Mirante to celebrate his first goal for Juve.